A short piece of the Green River Trail in Kent will be closed for 4 to 5 weeks beginning Monday. Same reason as last year — continued work on the river levee. Summer time is the best time for road and highway repairs, and I guess that’s true for bike trails as well. Work is currently underway on the Burke-Gilman, Green River, East Lake Sammamish and Snoqualmie Valley bike trails. April is “30 days of biking month,” when participants take a bike ride everyday and then take a photo or write a short piece about their ride for social media. Well, for any number of reasons, I didn’t do that. I applaud all those who did. A levee restoration project in Kent, WA, will keep a short section of the Green River Trail closed until June. There are at least two detours around the work that bicyclists can use. A central section of the Green River Trail that passes through Kent is now open for bicycle traffic, after being closed since March 2014. This is great timing, because it coincides with some spring-like weather this weekend. Update Jan. 6, 2015 — Workers are shooting for the Green River Trail to reopen in Kent by the end of January 2015, weather permitting. Basically some hand-rail work needs to be completed above the riverbank and some equipment is still using the trail. Meanwhile, the Interurban Trail detour is still open. Any plans you had for bicycling the Green River Trail in the next few years are being sandbagged. 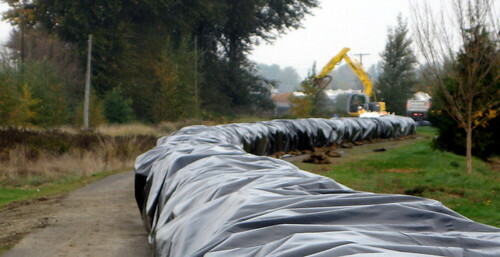 Crews are racing to erect a 3- to 4-foot high sandbag wall along the trail to help contain expected floodwaters in Kent and Tukwila if heavy rains strike the area this winter. The work stems from problems at the Corps of Engineer's Howard Hanson Dam upstream, where engineers are concerned about the structural integrity of the dam. They'll be releasing more water to reduce pressure on the dam, which could mean flooding downstream in the Green River Valley. The Green River Trail could be closed to bicycles for up to five years, if it takes the Corps that long to figure out how to solve and repair the problem. With the sandbags in the middle of the trail that sits on top of the levee, there's not enough room for safe usage by bike riders and pedestrians. The less scenic, but more direct, north-south Interurban Trail is slated to remain open. …..